When I started facilitating my first distributed meetings, I ran into a problem that many encounter: my primary collaboration tool would fail. It usually involved one person “losing connection” or in some cases the whole collaboration software system crashing for everyone. Regardless, it mean that someone in the conversation was unexpectedly disconnected or not equally connected. One way to solve this is to make sure you have a separate phone line as well as your collaboration software running during the meeting. However, this does not always work. In the first case I mentioned (one person loosing connection), you may not realize for some time that the person has been disconnected, especially if it’s by phone line. Also, that person disconnected by phone cannot easily notify others and they miss important information in the meeting. It occurred to me, that we were not using all of our “hailing frequencies” in our distributed meetings. So I experimented with having a chat backchannel in my meetings. It helped resolve many of the problems I had encountered and actually allowed for a more rich communication between the distributed participants. One new technique was the “buddy system” I wrote about previously. Another was enabling participants to ask questions when the could not easily break in on the audio channel or to have some sidebars which actually kept people more engaged in the conversations (you might want some working agreements about these sidebars). Have a separate application or chat window on another screen that is not shared. I prefer a separate chat window/app so I can quickly use a keyboard shortcut to switch over to the app and monitor or respond to messages. I’m often asked what chat application works best. I have used Hipchat (my current favorite as you can easily set up a meeting-specific chat channel), Yammer, and Flowdock. If you don’t have a shared organization chat tool, you could set up free trials of those tools or try more open chat tools like TodaysMeet, Neat Chat, or backchan.nl (a little more time is needed to warm up to this). Let me know if you find other useful chat tools for the backchannel. Make sure everyone in your meeting is also in the chat channel for the meeting. You might want to have this chat channel published in your calendar invitation or in visible working agreements in the meeting. Preferably, if you have a separate “app”, enable a non-audible notification when your participants send a message. I like this visible notification to show up on my screen shared with participants. A “bouncing icon” is the most popular option these days. When this notification shows up, everyone can see on your shared screen that someone is trying to get everyone’s attention. The bouncing chat icon reminds me of a raised hand. Note: some of the open chat systems I mentioned previously do not have this option. I’ve been using this backchannel concept for several years now and find it very useful for me as a facilitator and for my distributed meeting participants. 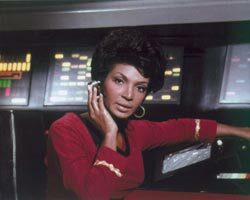 Thinking back to that communications officer in Star Trek, Lt. Uhura, I later learned that “uhura” is a Swahili word meaning “freedom”. I found the backchannel did give us tremendous freedom and flexibility in our distributed meetings. If you try it, let me know how it worked for you and if it freed up some conversations.